GALION — Early in the fourth quarter of their sectional final with Bishop Ready on Saturday , it looked like Northmor’s basketball season was coming to an end. After they’d been outscored 16-8 in the third quarter, the Knights gave up a quick basket to Collin Siemer to fall behind 40-28 with 7:21 remaining in the game. All Northmor did was shut out their guests for the rest of the quarter, allowing them to claw back and send the game to overtime. From there, the game went to a second extra session where the Knights took a 6-0 advantage to complete a dramatic comeback and claim a 50-44 victory to advance them into the district semifinals. Neither team could take control of the game in the first half. Tyler Kegley got Northmor off to a good start with a basket, but Ready tallied seven straight points to lead 7-2 three minutes into the contest. 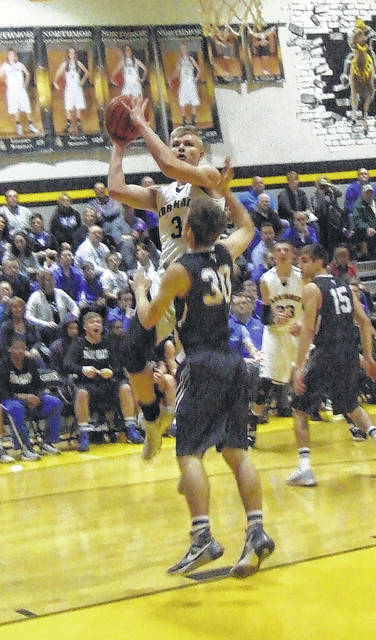 Northmor battled back with a Brock Pletcher three-pointer, a Zach Parrott basket and a basket-and-free throw from Kyle Kegley to jump back in front 10-9, but a late three-pointer by Brady Thomas staked Ready to a two-point lead after one period. Northmor got two three-pointers from Alijah Keen in the second quarter to lead 20-18 with two minutes remaining in the half, but a late Ready run put them back on top by a two-point margin at 22-20 going into the break. Ready then grabbed the momentum early in the third, opening the period with seven straight points to take a nine-point lead. Brock Pletcher scored four points to help the Knights get as close as a 33-28 margin, but Ready scored the final five points of the quarter to lead by 10 entering the fourth. After the score got up to a 40-28 margin, Ruth took a timeout, where he reminded his team how they had to come back at the end of the regular season at Highland in order to win a share of the Blue Division title. “We called a timeout to talk about what we had put on the banner and how we came back versus Highland,” he said, talking about the school’s banners for league and postseason championships in each sport that hang in the gym. Apparently that speech worked. After play resumed, Parrott hit a shot. Pletcher then drew a foul and hit one-of-two free throws, but the Knights got the ball back for Tyler Kegley to score. Kyle Kegley followed with a basket midway through the period to make the score 40-35 and Keen added his third three of the game to make it a two-point game with 2:39 left. Ruth noted that everyone on his team stepped up against Ready, citing Keen in particular. Demetrius Johnson tallied a basket with just over a minute remaining to bring the Knights all the way back. With the score tied at 40, neither team could put the other away in regulation, so the game went to an extra four minutes. Nothing was resolved in that overtime, though. Northmor took a 44-41 lead thanks to two free throws each by Johnson and Tyler Kegley, but Dominick Volini drained a three-pointer that sent the game to its second overtime. That final four minutes was all Northmor. It took nearly two minutes for anyone to break the tie, but Johnson hit a basket to make it 46-44. The Knights then got one free throw each from Pletcher and Johnson to go up by four. Kyle Kegley then blocked a three-point attempt by Ready and was fouled while collecting the ball. He hit both of his shots with 27.9 seconds remaining and after holding on defense a couple more times, the comeback win was completed and the court was stormed by jubilant fans. Both Keen and Kyle Kegley finished with 11 points in the game, while Pletcher and Johnson each added nine. After the game, Ruth considered his team’s sectional championship just one more accomplishment for Northmor athletics this winter — a season that’s included league and sectional titles for his team and the wrestling program, a district title for wrestling in which seven athletes qualified for state and an eighth-place finish for the girls’ bowling team in their state championships.